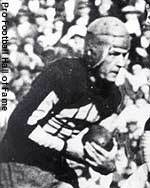 Harold "Red" Grange joined the Chicago Bears in 1925. Chris O'Brien sold the Chicago Cardinals to David Jones, July 27. The NFL added a fourth official, the field judge, July 28. Grange and Nevers returned to the NFL. Nevers scored six rushing touchdowns and four extra points as the Cardinals beat Grange's Bears 40-6, November 28. The 40 points set a record that remains the NFL's oldest. Dayton, the last of the NFL's original franchises, was purchased by William B. Dwyer and John C. Depler, moved to Brooklyn, and renamed the Dodgers. The Portsmouth, Ohio, Spartans entered the league. The Packers edged the Giants for the title, but the most improved team was the Bears. Halas retired as a player and replaced himself as coach of the Bears with Ralph Jones, who refined the T-formation by introducing wide ends and a halfback in motion. Jones also introduced rookie All-America fullback-tackle Bronko Nagurski.